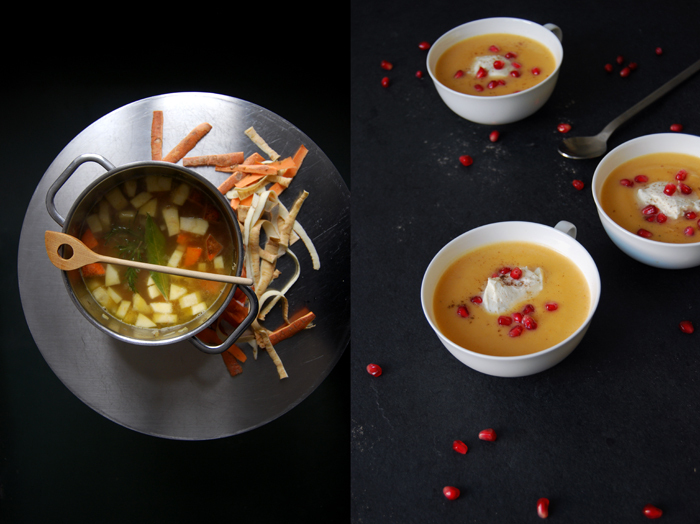 Roots and fruits are a great match for puréed soups, they merge to a deliciously warming treat full of fragrant flavours. They often balance each other out, like the strong parsnip which has such an overpowering impact that it’s best in combination with other ingredients that underline its subtle sweetness. 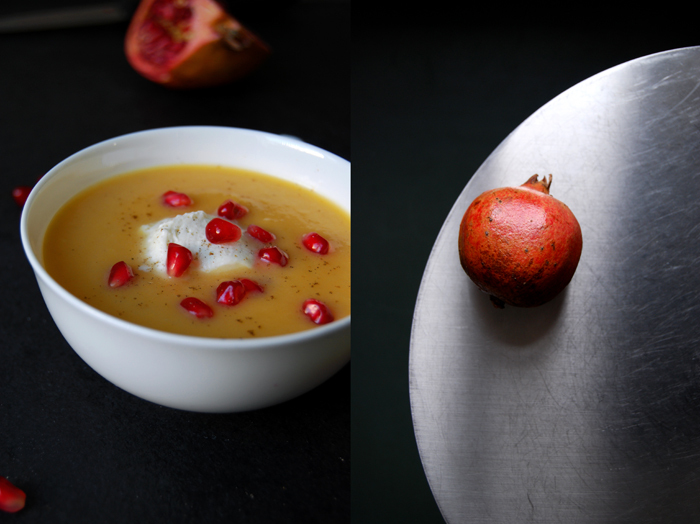 I went for robust sweet potatoes, a great team player, and juicy pomegranate seeds, their sourness is a wonderful addition to the earthy aroma. And, of course, their dramatic look is quite a stunner on the root’s pale pink! When I cook these kind of soups I like to spare on heavy cream, I just stir in a little bit to support the natural creaminess which is already given through the puréed vegetables. It doesn’t need much of the dairy product otherwise it will turn into a heavy meal and that’s the opposite of what I’m after. 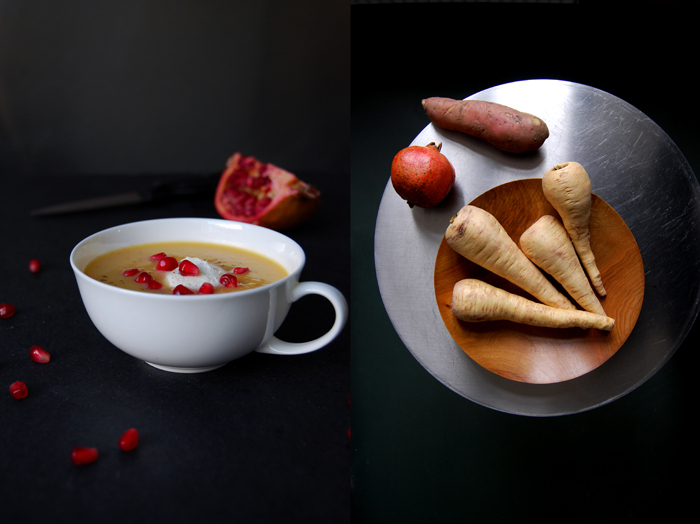 I prefer to refine the roots with another kind of milkiness, a discovery I made in October for my parsnip and pear soup. I used whipped mascarpone cheese, just a small spoonful, but this time I mixed it with cardamom and a bit of orange juice, it literally melted into the root composition! In a large pot, heat a splash of olive oil and cook the onion on medium heat until soft. Add the parsnip and sweet potato and cook for a minute. Pour in the broth and add the bay leaf and rosemary. Season with salt and pepper and cook for about 20 minutes or until the roots are soft. Take the rosemary out after 10 minutes and the bay leaf when the soup is done. 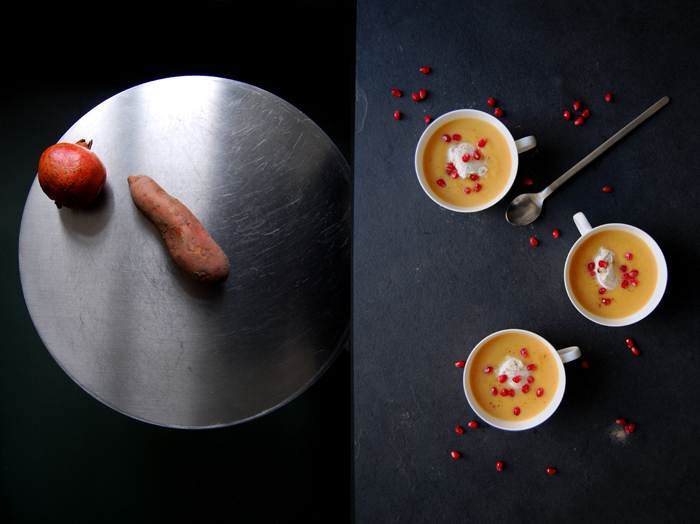 Purée the soup in a blender or with a stick mixer, stir in the heavy cream, honey and a pinch of cardamom, season to taste. Whisk the mascarpone with 1/4 teaspoon of cardamom and a splash of orange juice. Add a bit of heavy cream if it’s too thick and season to taste. 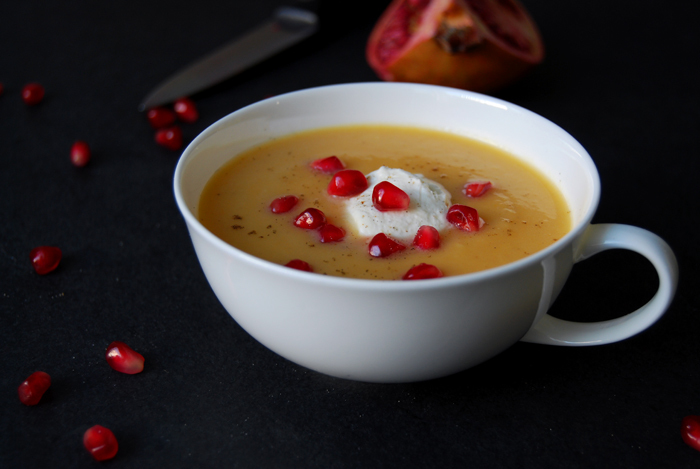 Serve the warm soup with a dollop of mascarpone, pomegranate seeds and some cardamom sprinkled on top. 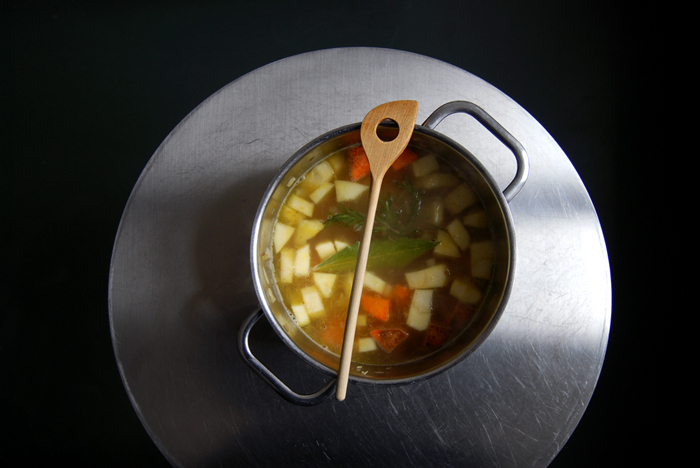 Made this last night – I can’t believe I didn’t make anything with parsnips all winter! This soup turned out so well, and I didn’t need to add any honey (it was sweet enough on its own) and the texture didn’t seem to need any cream so I was able to leave it out. This put me in the mood for your Himmel und Erde Suppe. Thanks!